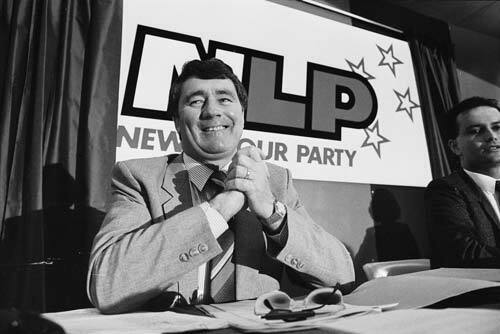 Jim Anderton shows off a logo for the New Labour Party in 1989. Although born in Auckland, as a member of Parliament Anderton has been strongly associated with Christchurch. He was elected as Labour member for Sydenham in 1984. Disenchanted with Labour’s policies during the 1980s, he formed the New Labour Party to represent working people. New Labour later joined the Alliance Party. In 2002 Anderton left the Alliance to establish the Progressive Party, of which he became leader. Anderton was deputy prime minister from 1999 to 2002, and then held a range of ministerial portfolios while the Progressives were in coalition with Labour from 2002 to 2008.